In an industry that seems to enjoy a slow evolutionary pace, a major step forward can be akin to the Big Bang. And a big bang is exactly what the Mercedes-Benz CLS made on its initial debut seven years ago. See, Mercedes-Benz went out and created a new car segment: the four-door coupe. Sure we were uneasy at the concept; coupes are supposed to have two doors, not four. But since then, the world (well, our automotive world) has taken notice and the four-door coupe segment has grown to include cars like the Aston Martin Rapide, Porsche Panamera and Audi A7. While those late to the game have just debuted their first attempts, Mercedes-Benz has unveiled their second-generation CLS, and it’s a doozy. The CLS550 features a streamlined 4.6-liter bi-turbo V-8 that delivers more power than the last generation and better fuel economy. A revamped exterior includes LED headlights, an aggressive front grille and body lines that encourage ogles, and the interior has been updated to add even more luxury amenities. With a low-slung look and four seats, the CLS finds itself in a middle ground between the roadsters and the full-size, five-seat sedans, and it excels at balancing sedan-like calm with sporting feel. Our opinion? Pick the CLS550 for a more refined driving experience (and a grippier one, with 4Matic arriving in September), or choose the CLS63 AMG for a rip-roaring ride. You’re guaranteed a good time either way. The CLS550 has a full complement of safety systems, both optional and standard, including adaptive highbeams and night view assist with pedestrian detection. The cabin is whisper quiet and obscenely comfortable. Exterior styling manages to be both beautiful and aggressive. Thanks to a number of innovations, gas consumption is surprisingly low – and you’ll benefit by saving at the pump and avoiding the gas guzzler tax. The push button for park is unnecessarily fussy, and for a car filled with technology, the Comand infotainment system continues to be neither intuitive nor easy to learn. We wish Mercedes-Benz had extended the implementation of the Eco stop/start feature to the CLS550; as of now it’s still only available on select AMG vehicles. Keyless start should be standard at this price. 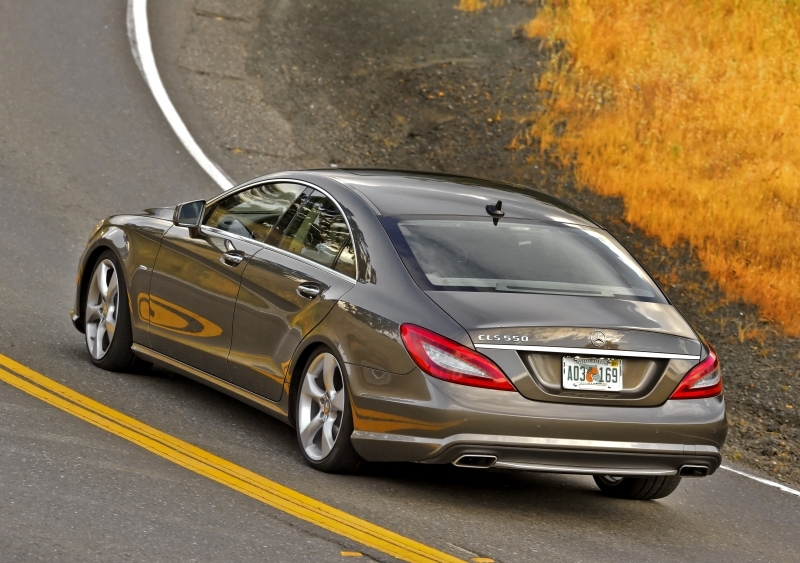 The CLS63 may be the star of the show, but the CLS550 is the more livable of the two. Sliding into the driver’s seat, it’s not immediately apparent what type of car this will be. Steering wheel-mounted paddle shifters are a nod to its sporty side, while a one-touch seat massaging function leads you to believe you’re in for a softer ride. Turning on the car, however, gives it all away. The smaller V-8 is a more subdued engine, and instead of the throaty growl of the 63’s 5.5-liter, the 550’s features a low burble. Not a bad thing, though, as you’ll notice that the CLS550’s adaptive damping system creates a compliant and forgiving drive (unlike the 63’s aggressive road feel), and keeps things smooth when cruising down the road. Acceleration is still fantastic, with twin turbochargers feeding the engine and a seven-speed transmission swapping gears with pinpoint accuracy. Steering input is variable, so you’ll maneuver around parking lots as easily as you will winding roads, and Mercedes-Benz is even including 4Matic all-wheel drive as an option starting late 2011 so the CLS will feel at home during the winter months. A number of technologies are on hand to make the drive even easier. Opt for the Parktronic system and your car will size up a parallel parking spot and then guide itself into it. A manual mode will let you select gears yourself, and a system called Lane Keeping Assist will actually apply brakes on specific wheels to guide you back into your lane if it senses the car drifting accidentally. The CLS has downsized its engine, yet gained more power in the process. Its 4.6-liter bi-turbo V-8 produces 402 horsepower and 443 lb-ft of torque (a big jump from the previous 382/391). A seven-speed automatic transmission will shift for you or allow you to swap gears via steering wheel-mounted paddle shifters. 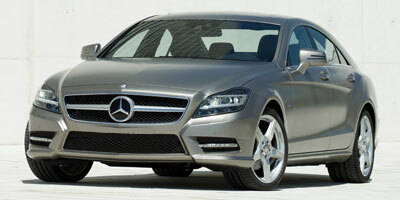 Rear-wheel drive is standard, but the CLS550 will soon be available with 4Matic all-wheel drive as well. In its 125 years as a company, Mercedes-Benz has consistently improved upon comfort and technology in the cabin, and the CLS550 is yet another recipient of some remarkable features. Seat massagers and dynamic side bolsters – which react to steering inputs to keep you put – are optional for both the driver and passenger. To help with reduced visibility from the cabin, Blind Spot Assist steps in to let you know when vehicles are approaching your flanks. Night view assist uses the central screen to display a clear view of the road ahead, and can detect pedestrians in your path. Engine modifications and a new transmission, as well as other factors, contributed to a bump in fuel economy for the new CLS550. It now returns 18 mpg in the city and 26 mpg on the highway, frugal numbers for a heavy, V-8-powered luxury vehicle, and impressive considering the outgoing 14/21. 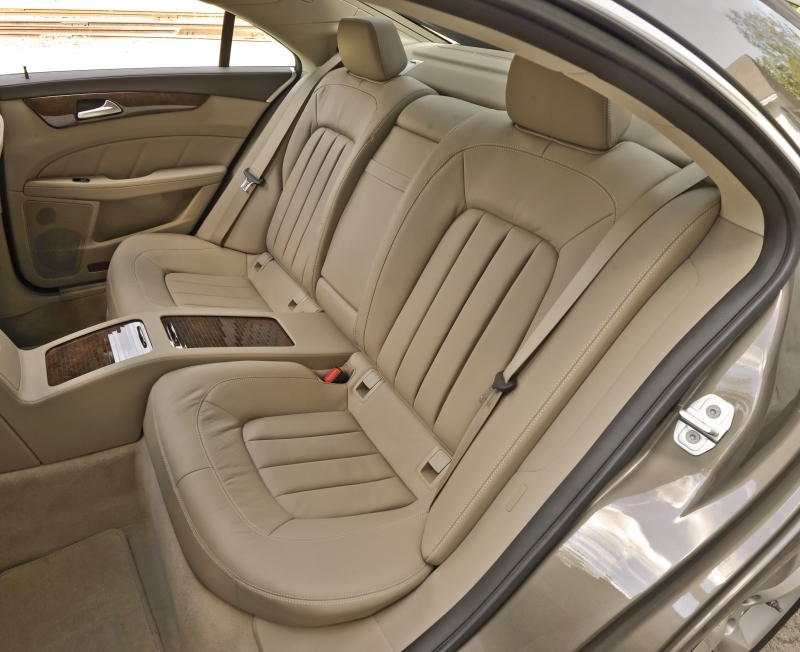 The interior’s a luxurious affair, with soft leathers covering most surfaces. The dash, available in various wood or metal materials, surrounds elegant gauges and a well-laid out instrument panel. We’ve already mentioned the front seats, but we’d be remiss not to say that the two rear ones have a good amount of head and legroom, making them comfortable for the average-sized adult. Cubby spaces abound, and there’s plenty of luggage space in the trunk, especially if you fold down the second row. There’s a lot to love in the exterior design of the CLS, and much of that has to do with its inspiration: the SLS Gullwing. The grille dominates the front-end and 74 LEDs blaze through cat-eyed lights. Aggressive lines trace along the rear haunches and cut the length of the body. Five-spoke wheels show off brightly colored brake calipers. 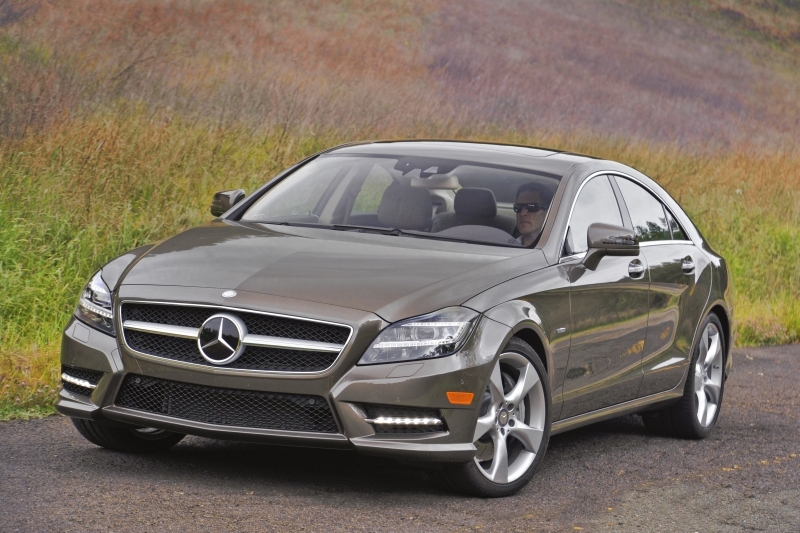 You can have the second-generation CLS550 for $71,300 and the 4Matic trim for $73,800. Both fall far under the MSRP for the CLS63 AMG, which starts at $94,900. But there are now a number of other low-slung four-doors looking for a fight within this price range, and you’ll be smart to take a look at the Audi A7 and Porsche Panamera S ($89,800) as well. With its current lineup, it’s hard to go wrong with a Mercedes-Benz no matter which vehicle you buy. That said, the CLS550 blends all the best bits of what Mercedes has to offer: a plethora of safety systems, brilliant drive dynamics and luxurious standard features. It also happens to be stunningly well designed and fairly fuel efficient too. And now that all-wheel drive is just around the corner, the competition isn’t going to stop playing catch up any time soon.